Eastern Montgomery County has long waited for the jobs and economic opportunities other parts of this affluent county take for granted. Now, a new town center and research park might finally get off the ground. 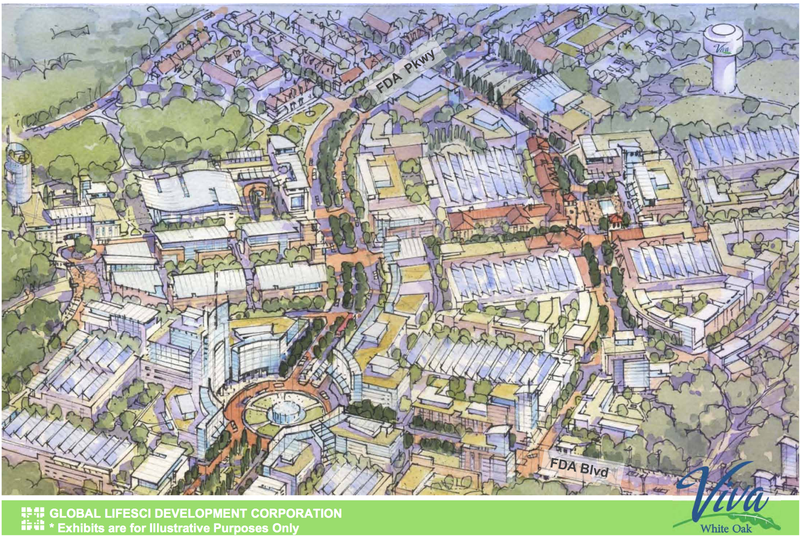 A rendering of Viva White Oak's future "Village Center." All images from Montgomery County unless noted. Fifty years ago, White Oak was a booming suburb that inspired the sitcom “The Wonder Years.” But the area has seen little investment in recent decades, and residents have to travel long distances to access jobs and shopping areas in more affluent areas like Bethesda and Rockville. 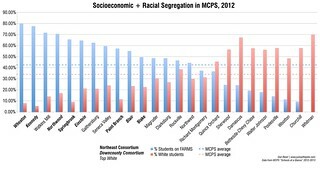 The lack of access to economic opportunities has resulted in lower incomes and a higher poverty rate than the rest of the county. The Great Recession hit the area hard, and home prices are still recovering. Montgomery County officials hope to change this by turning White Oak into a hub for life sciences research, centered on the Food and Drug Administration, which moved there ten years ago, and Washington Adventist Hospital, which is building a new facility here. An aerial perspective of Viva White Oak. Most buildings would be a few stories tall, though some could rise as high as 220 feet. 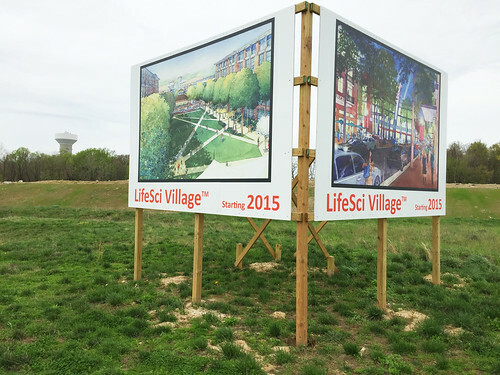 Last year, the county struck a deal with developer Percontee to build Viva White Oak, a new town center and research park near Route 29 and Cherry Hill Road that was originally proposed under the name "LifeSci Village" over a decade ago. The 280 acre site, located between the FDA campus and the new hospital, consists of a shuttered sludge treatment plant the county owns and Percontee’s former concrete recycling center. Last week, Percontee (working under the name Global Lifescience Development Corporation) and county officials presented their plans at the White Oak Recreation Center, reports local blog Growing East County. The developers are about to send the Planning Department their sketch plan, which is a more general vision of the development that occur. When the project is ready to begin, the developer will submit detailed plans for specific portions of the project for approval. As a result, we only know that Viva White Oak will have roughly 12 million square feet of stuff when it’s completed, including up to 5,000 homes, shops, offices, and research buildings. But the site plans show four distinct “neighborhoods” with different types of activities in them. A grid of streets would thread through the entire project, allowing residents, workers, and visitors to walk or bike, while trails would connect the project to Paint Branch Park. Twenty percent of the 280-acre site (56 acres) would be parks and open space, including several squares and plazas. 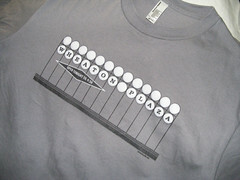 Viva White Oak's four neighborhoods. The "West Neighborhood" and "East Side" would be built first. The “West Neighborhood” and “East Side” are at the edges of the development, closer to Route 29 and Cherry Hill Road, and would have a mix of townhouses, apartments, and some commercial buildings. Those sections will be built first. Viva White Oak’s first phase will include up to 1,000 new homes and 300,000 square feet of commercial space, as per the developer’s agreement with Montgomery County. 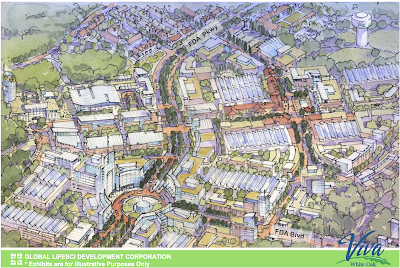 The project’s second phase is the “Village Center” at the center of the site, where the three new roads meet, and would have apartments, offices, and shops. 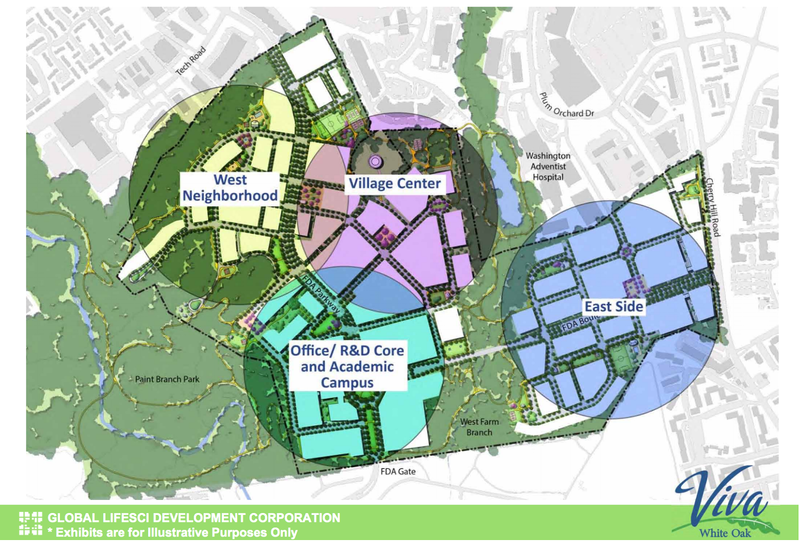 The final phase would be the “R&D Core,” located at the south end of the site next to the FDA campus entrance. It would have a mix of offices and academic facilities, and some of the development’s tallest buildings as well. Zoning allows buildings up to 220 feet tall at Viva White Oak, but most of the buildings shown appear to be low-rise, between three and six floors. To get the ball rolling, the county will contribute $47 million to clear their portion of the land, and to split with the developer the costs of building three new roads connecting the land to Industrial Parkway, Cherry Hill Road, and the FDA. The county's new Bus Rapid Transit line on Route 29, which will open in 2020, could carry workers and residents to Viva White Oak. The project also includes land for a new school; nearby Galway Elementary School is at capacity now and will remain close to it for several years. But will companies want to come here? Viva White Oak has been in the works since 2005 and it looks like things are finally coming together. Neighbors who were at the meeting last week say they're really excited about the project. But we still don’t know if scientific companies or research institutions will want to come here. And Viva White Oak’s suburban location may be a turnoff to companies who seek closer-in, transit-served locations. The Viva White Oak (formerly LifeSci Village) site today. That said, East County doesn’t have a walkable, urban-ish development like what’s been proposed here, and this could both attract the many people who want to live in a place like that or even near a place like that. Retailers seek a base of residents to shop at their stores. And companies increasingly value being in environments where their workers can shop or live nearby. There are still lots of unanswered questions about Viva White Oak. But if something actually happens here, it could be the start of a virtuous cycle.